Learn how to form positive habits that will help you become 51% more likely to hit your quota in our social selling tips for making LinkedIn a daily habit. Humans form habits in order to simplify their lives and free up processing power in their brains. By forming the right habits, you are essentially programming yourself to perform the actions that lead to successful outcomes. Sellers who have a habit of using LinkedIn are 51% more likely to hit their quotas than other sales professionals. By consistently focusing on creating a professional brand, connecting with the right people, engaging with insights, and building strong relationships, sales professionals can increase their sales opportunities by up to 45%. When trying to form a new habit, the key is to commit to specific actions every day, no matter what else comes up. To make social selling on LinkedIn automatic, block off time in your calendar. It doesn’t matter if you schedule it in the morning, right after lunch, or before you head home for the day, what matters is that you stick to this commitment. If you are constantly moving tasks around during the workday, open up LinkedIn before you boot up your email every morning. Researchers found that people trying to start an easy-to-put-off habit, such as exercise, are more successful when they do it before diving into their workday. 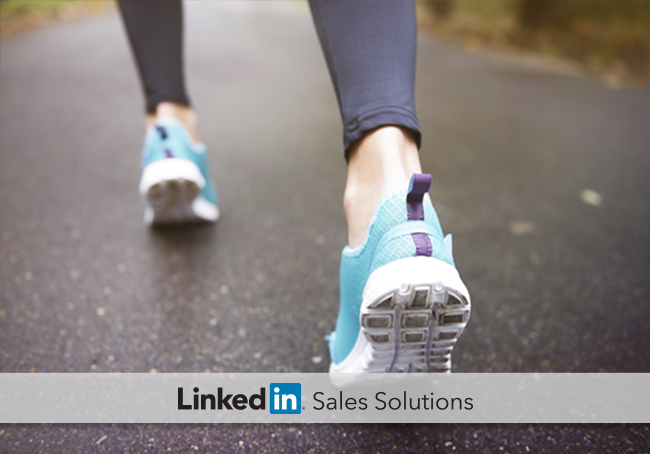 Make it easy to fit social selling on LinkedIn into a busy schedule by easing into your new habit. The top social sellers use LinkedIn one to two hours per day, but even a small investment of time can positively impact your sales results. Think of it as training for a marathon. When you begin training, the goal is to start with short distances. Similarly, the key to forming a new habit is to make it easy to start so that you can evolve through small progressions. Once an activity is an established part of your day, you can invest more time. Begin your new social selling habit by committing to spend a few minutes per day on LinkedIn for a month (whatever you are comfortable with, as long as you are consistent). Use this time to reach out to a new prospect, renew a relationship with an existing connection, answer a question in a LinkedIn Group, or share a thought-provoking article. As the days and weeks pass, you will begin to see the value of your output and you will be well on your way to forming a healthy habit. The ultimate reason to make social selling on LinkedIn a habit is to increase sales opportunities and reach your quota faster. Trick your brain into sticking with new habits by setting tangible, reachable, short-term goals. Every time you achieve a goal, your brain will feel positive about using LinkedIn and will reinforce your motivation to continue. Using LinkedIn every day leads to more sales opportunities, more sales, and a more engaged professional network. Making effective social selling activities an automatic part of your daily routine will automatically make you a better social seller.